Dirk Franklin loves kicking back with a picnic on the lawn and nice glass of wine. But while relaxing with his wife in his backyard one evening, Dirk spilled his expensive glass of wine. Realizing all wine glasses are prone to tip when you sit and sip on the grass, Dirk set out to solve this common problem. His solution -- and his business -- is called Drink Daddy. Here’s how Dirk turned a concept into a popular product available on his website and on Amazon. Dirk will be selling Drink Daddy at the Bazaar at this year's SOLD OUT QB Connect 2017 in San Jose. Dirk, tell us the story behind your business. When you drink wine at a picnic or an outdoor venue, you risk spilling it. If you spill high-quality wine, that might be $10 - $20 worth of spillage. Plus, you’ve lost the experience of enjoying that wine. When this happened to me, my wife suggested I invent something to solve this problem. After this “ah-ha” moment, I started sketching the product I envisioned. I knew it had to be lightweight, height-adjustable, easy to set up and would accommodate stemware and wine bottles. Philosophically speaking, I wanted to build something that would help people enjoy being outside with friends and family. The Drink Daddy is about simplifying outdoor entertaining and making it fun. How do you turn an idea into a real product? Turning a concept into a product is a huge undertaking! I became an expert in all areas of my business. I learned how to set up a company, find investors, choose materials and design a product that was easy to manufacture. I kept a product-design notebook and created mechanical drawings for every single part of the product. I had some experience with designing and creating things -- I built a custom Jeep a few years ago. A friend who makes prototypes for medical devices helped me develop a proof of concept. I also hired an industrial designer and mechanical engineer. From there, I had to figure out how to scale up and create a product people could buy. I took a few trips to China to explore different factories and meet suppliers. I was very involved in the design and manufacturing process, as I wanted an affordable, high-quality product. I first sold Drink Daddy for $249. It was made with very high-end materials including marine-grade fabric and hard, anodized aluminum. Over time, though, I’ve been able to modify the design prototype and use a smaller box for shipping. Now I sell Drink Daddy for $99, which is a huge milestone. I still have my 9-5 job as an electrical engineer, so there’s no “typical” routine. However, Mondays are my biggest day for Drink Daddy because that’s when Amazon drops its purchase orders each week. Every Monday I get product lined up to ship from our warehouse. What advice would you give to a small business owner starting out? Running your own business is about following your heart. But it’s also about making hard decisions. Ask yourself if you’re in love with your idea and if it’s a financially sound business proposition. Many people have good ideas, but the economics aren’t right. If that’s the case, the business will never be successful. Another thing to remember is that your friends and family aren’t the best people to ask for feedback. They won't give you an honest answer because they don't want to hurt your feelings. It’s much better to find a trusted advisor, someone you can go to with pointed questions and get meaningful feedback. I really love the energy of small business owners. These are individuals who are turning their passion into a livelihood. There's a sparkle and a magic to their experience, and the feeling is infectious! I’m excited to go to QuickBooks Connect to experience that excitement and learn from others. I hope to take their learnings and apply them to my own business. 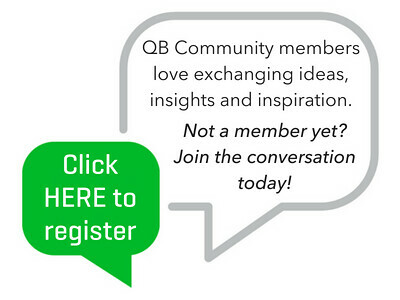 QuickBooks Connect & Beyond...Join Our QB Community! Dirk's small business story is one of many featured here in the QuickBooks Community. We believe we're strongest when we share and learn from each other! If you agree, you've come to the right place. Joining the QB Community connects you to others who, just like you, who dare to work for themselves. Very clever idea Dirk! I look forward to connecting with you at QB Connect to learn more about your journey into fabrication! Wow, there's so much fascinating stuff in this article -- especially if you've got a new idea for a product. I'm particularly impressed by how Dirk stayed "nimble" when designing and redesigning his outdoor drink caddy in order to make it more affordable. Well done, Dirk. Anyone out there mulling a great new invention to use in the great outdoors? Tell us!